l love bread. I could live on bread alone. And I don’t know why prior to this, I have never attempted to make bread in my home. But Malin Elmlid may just inspire me to. Her book The Bread Exchange includes tales and recipes from a journey of bread making and bartering. My first thought was how fitting the name of the book was. When I think of the most memorable bread moments – devouring a warm loaf – I think of it as a sharing moment. You never just buy a whole loaf by yourself and eat it all (although now from the sounds of it, that may not be completely impossible to fathom). But there's a lot more to this book. The Bread Exchange tells the story of one woman’s hunger for greater meaning in her life and how it has been enriched by the sharing of hand-made bread. From her cozy kitchen in Berlin to a flat in London, from a deck in New York City to huddling around a tandoor in Kabul, the author shares discoveries, stories, and recipes from her inspiring travels. And, just like the title suggests, the collection holds recipes from contributors all over the world. Whether it's Cheese Phyllo Squares from Sinai, or Blood Orange Curd With Rosemary from Bavaria, Bread Exchange is an eclectic mix of recipes that isn't just about bread. There's even a Hibiscus-Ginger Cocktail And Concord Spritzer Cocktail, which is colourful and matches perfectly with the early fall season. There's so much I learned from this book. For example, stories of how the first bread in history may have been baked thousands of years ago in the Sinai Desert. Tell me a story that moves me. Show me something I have never seen before. Teach me something I did not know. Bring whatever you do that you are proud of. And I will share my bread with you. What surprised me the most was the fact that she isn’t a full-time baker who had an opportunity to share her stories. Rather, this busy fashion-industry professional had a bread-baking obsession, started offering her loaves to others in return for recipes and handmade goods. 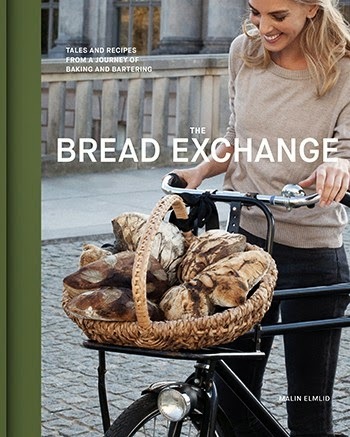 Bread Exchange isn’t just a recipe book…it is a book of tales and reflections, of wanderlust connections. But okay, what would a bread book be with a few recipes, so there are 50 of her favourite naturally leavened breads and other delicious things collected on a journey honouring the staff and stuff of life. Published by Chronicle Books and distributed in Canada by Raincoast Books.